Wareham Forest Lodge Retreat in Holton Heath sleeps between 2 and 8 people, with the accommodation being lodges. Wareham Forest Lodge Retreat in Holton Heath, Dorset is surrounded by nature walks and cycle routes. Wareham Forest Lodge Retreat is a hideaway which is the perfect base to make memories with the whole family, with sheltered coves, beautiful gardens and coastal towns brimming with activities close by. Many of the lodges at Wareham Forest Lodge Retreat in Holton Heath, Dorset come with their own private hot tub. If you want to find out what other people have said about Wareham Forest Lodge Retreat, read the reviews on Wareham Forest Lodge Retreat for more information. And, for those last minute bargains, have a look at some of the special offers available at Wareham Forest Lodge Retreat. "Luxurious and contemporary lodge with one spacious double with stylish ensuite bathroom with bath with overhead shower. Modern, well equipped open plan living/kitchen area. Patio doors leading to decking. 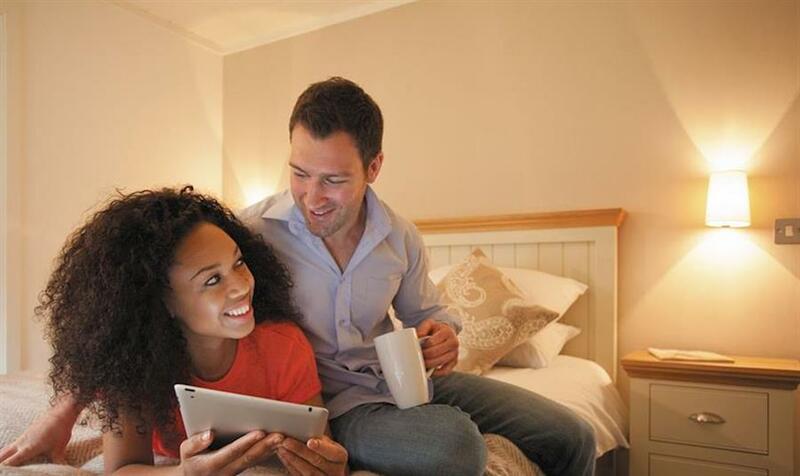 Perfect for a luxurious, romantic break away to celebrate any occasion." "Luxurious and contemporary lodge with one spacious double with stylish ensuite bathroom with bath with overhead shower. Modern, well equipped open plan living/kitchen area. Patio doors leading to decking with outdoor hot tub. Perfect for a luxurious, romantic break away to celebrate any occasion. " "Spacious and contemporary lodge with one double with ensuite shower and one twin. Bathroom with bath with overhead shower. Modern, well equipped open plan living/kitchen area. Patio doors leading to spacious decking. Perfect for a peaceful family break away. " "Spacious and contemporary lodge with one double with ensuite shower, and one twin. Bathroom with bath with overhead shower. Modern, well equipped open plan living/kitchen area. Patio doors leading to spacious decking and outdoor hot tub. Perfect for family breaks in the region. " "Luxurious and contemporary lodge with one double with stylish ensuite shower and one twin. Spacious shower room. Modern, well equipped open plan living/kitchen area with patio doors leading to outdoor decking. Ideal for family escapes in the region. " "Brand new for 2017. Luxurious and contemporary lodge with one double with stylish ensuite shower and one twin. Spacious shower room. Modern, well equipped open plan living/kitchen area with patio doors leading to outdoor decking with outdoor hot tub. Ideal for a relaxing break with family and friends. Opening in December 2016, images shown are for illustrative purposes only." "Stunning, spacious lodge with one double with ensuite shower and one twin. Stylish shower room. Contemporary styled, well equipped open plan living/kitchen area. Patio doors leading to outdoor decking. Perfect for a break with family or friends. " "Stunning, spacious lodge with one double with ensuite shower and one twin. Stylish shower room. Contemporary styled, well equipped open plan living/kitchen area. Patio doors leading to outdoor decking with outdoor hot tub. Ideal for a break with loved ones. " "Luxurious and contemporary lodge with one double, with stylish ensuite shower and dressing room, and two twin. Spacious bathroom with bath with overhead shower. Modern, well equipped open plan living/kitchen area. Patio doors leading to spacious decking. Perfect for a peaceful break away with family or friends. " "Luxurious and contemporary lodge with one double, with stylish ensuite shower and dressing room, and two twin. Spacious bathroom with bath with overhead shower. Modern, well equipped open plan living/kitchen area. Patio doors leading to spacious decking and outdoor hot tub. Ideal for a holiday with family or friends to celebrate any occasion. " "Luxurious and spacious lodge with two doubles, one with a contemporary styled ensuite shower and dressing room, and two twin. Spacious bathroom with bath with overhead shower. Modern and well equipped open plan living/kitchen area. Patio doors leading to spacious decking and outdoor hot tub. Ideal for celebrating any occasion with families or groups of friends. " Find out about Wareham Forest Lodge Retreat, including prices and availability. There are 68 holiday parks within 5 miles of Wareham Forest Lodge Retreat. Shepherds Den in Petersfield, Hampshire, and sleeps 2 people. 49 miles. Ashton Mill Cottage in Steeple Ashton, Wiltshire. 40 miles. Lilac Place in Colyton, Devon, and sleeps 6 people. 43 miles. Saughtrees in Fordingbridge, Hampshire. 23 miles. Quince Cottage in Langton Matravers, Dorset, and sleeps 2 people. 9 miles. Tinks House in Ryde, Isle Of Wight. 41 miles. Pixie Cottage in Yarmouth, Isle of Wight, and sleeps 6 people. 29 miles. Longbridge Cottage in Shepton Mallet, Somerset, and sleeps 2 people. 38 miles. Snowdrop Cottage in Ringwood, Hampshire, and sleeps 8 people. 17 miles. Hillview in Bridport, Dorset, and sleeps 4 people. 28 miles. Bracken in Brighstone, Isle of Wight, and sleeps 10 people. 31 miles. Tor View in Glastonbury, Somerset, and sleeps 5 people. 39 miles. Coastguard Cottage in Wareham, Dorset, and sleeps 7 people. 10 miles. Mallard Cottage in Andover, Hampshire, and sleeps 5 people. 41 miles. Lanreath in Fordingbridge, Hampshire, and sleeps 6 people. 23 miles. Secret Cottage in Shanklin, Isle of Wight, and sleeps 2 people. 40 miles. Canute Cottage in Portland, Dorset, and sleeps 5 people. 19 miles. Maydene in Shanklin, Isle of Wight, and sleeps 6 people. 40 miles. Wallflower Cottage in South Petherton, Somerset. 34 miles. Anchor Cottage in Weymouth, Dorset. 19 miles. Purcombe Farmhouse in Bridport, Dorset, and sleeps 12 people. 33 miles. The Owl House in Bishops Waltham, Hampshire, and sleeps 6 people. 44 miles. Marley Mount Farm in Lymington, Hampshire, and sleeps 10 people. 20 miles. Wychwood in Yarmouth, Isle of Wight, and sleeps 12 people. 24 miles. Smokeacre Farm Cottage in Yeovil, Somerset, and sleeps 2 people. 29 miles. The Bakehouse in Bridport, Dorset, and sleeps 4 people. 32 miles. Cockle Warren in Hayling Island, Hampshire, and sleeps 14 people. 49 miles. Hollyhock House in Salisbury, Wiltshire, and sleeps 6 people. 27 miles. Sexeys Farm Stable in Wareham, Dorset, and sleeps 6 people. 7 miles. Colts Close Stables in Wool, Dorset, and sleeps 4 people. 7 miles. Whitecroft Farmhouse in Newport, Isle of Wight, and sleeps 11 people. 35 miles. Hermitage Country House in Whitwell, Isle of Wight, and sleeps 22 people. 35 miles. Leam House in Portland, Dorset, and sleeps 8 people. 20 miles. Larkhall Square in Bath, Somerset, and sleeps 6 people. 48 miles. Colts Close Cottage in Wool, Dorset, and sleeps 8 people. 7 miles. Breaches Barn at West Park Farm in Fordingbridge, Hampshire, and sleeps 11 people. 19 miles. Five Bells in Axminster, Devon, and sleeps 5 people. 40 miles. Seagers Cottage in Wareham, Dorset, and sleeps 8 people. 7 miles. Four Oaks in Christchurch, Hampshire, and sleeps 8 people. 15 miles. Bow Bridge Cottage in Ilminster, Somerset, and sleeps 4 people. 41 miles. Priory Cottage in Freshwater, Isle of Wight, and sleeps 10 people. 25 miles. Barrowswood Lodge in Cheddar, Somerset, and sleeps 8 people. 49 miles. Derrymore House in Shanklin, Isle of Wight, and sleeps 8 people. 40 miles. Woodmans Stoup in Colyton, Devon, and sleeps 10 people. 43 miles. Durdle Door Holiday Cottages in West Lulworth, Dorset. 10 miles. The Victorian Barn and Dairy House Farm Cottages in Blandford Forum, Dorset. 14 miles. West Park Farm in Fordingbridge, Hampshire. 19 miles. Boshill House in Lyme Regis, Dorset, and sleeps 14 people. 42 miles. Silverland in Lymington, Hampshire, and sleeps 14 people. 21 miles. Peppers Lodge in Cheddar, Somerset, and sleeps 4 people. 47 miles. Pennsylvania Castle in Portland, Dorset, and sleeps 20 people. 20 miles. Lymelight in Lyme Regis, Dorset, and sleeps 8 people. 37 miles. Rossiters Cottage in Yarmouth, Isle of Wight, and sleeps 6 people. 28 miles. The Old House in Southampton, Hampshire, and sleeps 11 people. 35 miles. WhileAway Lodge in Cheddar, Somerset, and sleeps 4 people. 47 miles. Quakers in Membury, Devon, and sleeps 4 people. 42 miles. Kingston Manor in Shorwell, Isle of Wight, and sleeps 16 people. 34 miles. The Wookey House in Wells, Somerset. 43 miles. Munty Cottage in Taunton, Somerset, and sleeps 4 people. 48 miles. Dippers Folly at Jeffries Mill Cottages in Frome, Somerset, and sleeps 4 people. 38 miles. North End Farm House in Bridport, Dorset. 32 miles. Puckhams in Stoke Abbott, Dorset. 31 miles. Oak Cliff Place in Ryde, Isle of Wight, and sleeps 16 people. 38 miles. The Gate House in Wimborne Minster, Dorset, and sleeps 14 people. 7 miles. Quay House in Christchurch, Dorset, and sleeps 12 people. 14 miles. Shrover Hall in Denmead, Waterlooville, and sleeps 6 people. 47 miles. Waverley Reach in Hamble, Hampshire, and sleeps 9 people. 35 miles. Binfield House in Newport, Isle of Wight, and sleeps 11 people. 36 miles. Myrtle Cottage in Ventnor, Isle of Wight, and sleeps 6 people. 40 miles. Bodwen in Ryde, Isle of Wight. 38 miles. Yellowstones Beach House in Bournemouth, Dorset, and sleeps 26 people. 9 miles. Fossilers Lodge in Lyme Regis, Dorset, and sleeps 8 people. 37 miles. Melville Lodge in Ventnor, Isle of Wight, and sleeps 14 people. 39 miles. Pigeon Coo Farmhouse in Hamstead, Isle of Wight, and sleeps 9 people. 29 miles. Bucks Cottage in Glastonbury, Somerset, and sleeps 12 people. 36 miles. Waters Edge in East Cowes, Isle of Wight. 36 miles. The Piglet in Sidbury, Devon, and sleeps 2 people. 49 miles. The Old Reading Room in Langton Herring, Dorset, and sleeps 5 people. 21 miles. Advantage Point in West Lulworth, Dorset, and sleeps 10 people. 10 miles. Commodores Penthouse Suite in Portland, Dorset, and sleeps 8 people. 19 miles. The Skilling in Bridport, Dorset, and sleeps 13 people. 30 miles. Greystones in Winchester, Hampshire, and sleeps 8 people. 40 miles.